Posted on March 7, 2014 . February is over and that means 2 things: First, it’s spring time! Well, not officially, but the weather forecast is showing double digit temperatures (nope it doesn’t matter it’s only 10-11 degrees), so for me it is spring. And second, I have an opportunity to look back what I’ve been loving last month once again. So let’s get right on it. I haven’t really expected that much from a funny looking plastic hair brush. Sure, I wanted to try it badly, because everyone has at least one. But it is truly remarkable! I brush my thin fine hair dry, because I can’t lose any more hair than is necessary, and the job was never so easy. Almost no lost hair, no tangles and no split ends. Does anyone know, what’s the secret behind this miracle worker? As I mentioned in my Everyday makeup routine, this lip balm hasn’t left my lips since the day I bought it. I won’t rave about it again but yes, it’s that good! I now have three Korres lip butters in my collection, but ‘Quince’ is my favourite. 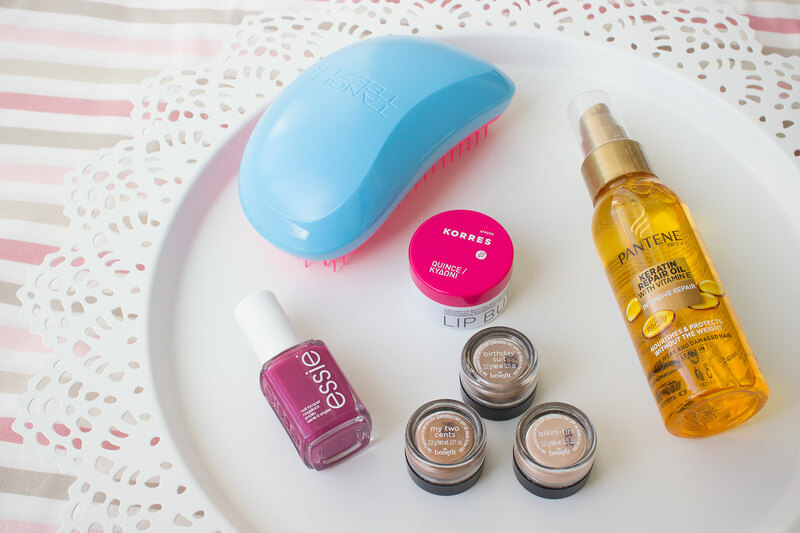 It couldn’t be a monthly favourites post without throwing in some nail polish, right? ‘Big Spender’ is a gorgeous purple pink. It’s not too dark but not too bright either which makes it the perfect transitional colour between winter and spring. I had it on my nails for 10 days without any chipping. I think I’ve been living under the rock until now. I haven’t wanted anything oily to even touch my already getting-greasy-super-quick hair. But after I had my hair chopped I decided to keep the ends healthy as long as possible. This Keratin Repair oil for has been super helpful. It absorbs really quickly leaving my hair nourished and it doesn’t weight them down at all. These little bad boys came with some Benefit makeup sets I bought back in summer. I used them a couple of times but I have never really fell in love like I did with Maybelline Color Tattoos. But I gave them another chance last month and oh my, I’m so glad I did. I now even prefer the Creaseless Cream Shadows. They are more creamy and blend even better than CT. They last “only” about 8-10 hours without creasing (CT don’t crease even after 12 hours) but that doesn’t bother me at all. And what I love the most is that I don’t get any shimmer fall out like I do with Maybelline ‘On and on bronze’. So who’s excited for spring more than I am? And what’s made it to your February favourites list?